Time flies, and finally I have found the time to publish the statistics derived from the cyber attacks timelines of February (part I and part II). Before drilling down into the statistics, let me say that many readers keep on asking how I derive the statistics: I collect and publish every two weeks (more or less) a timeline of the main attacks occurred, and I use these attacks to compile the statistics. Just click on one of the two links above to figure out a timeline is structured and what information is used for the statistics. And by the way, each timeline also contains the source of the information (just click in the description), so please stop asking what’s the source for the timelines :-). Despite the 28 days, the number of recorded attacks keeps growing, and the Daily Trend of Attacks chart shows the time distribution, which confirms a sustained level of activity throughout the month with a peak at the very beginning, and a tail of events in the last week. 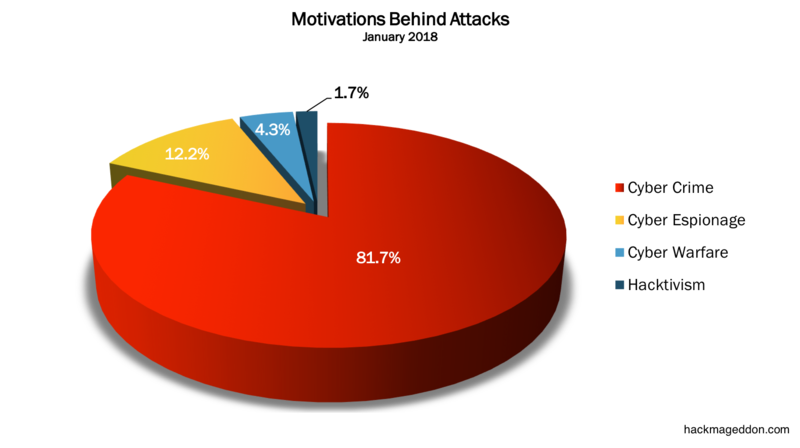 February confirms the momentum for Cyber Crime, which ranks on top of the Motivations Behind Attacks chart with 86.4% (it was 81.7% in January). Cyber slides to 9.1% from 12.2% from 9.9%, while Hacktivism is at 3.8% from 1.7% recorded in January. Cyber warfare drops to 0.8% from 4.3%. Malware confirms its leadership of the Attack Vectors chart with 31.8%, a sharp decrease from the levels of January (43.5%). Account Hijackings are stable at number two with 24.2%, this time a sharp increase in comparison with the 14.8% of January). Similarly to Targeted Attacks, up to 12.1% from 9.6%. The Distribution of Targets chart shows that Single Individuals lead once again the group with 28% (it was 40% in January). Multiple targets rank at number two with 13.6%, ahead of Public Administration (12.9%) and Information and Communication targets. If you want to have an idea of how fragile our data are inside the cyberspace, have a look at the timelines of the main Cyber Attacks in 2011, 2012, 2013, 2014, 2015, 2016, and 2017 (regularly updated). You may also want to have a look at the Cyber Attack Statistics.